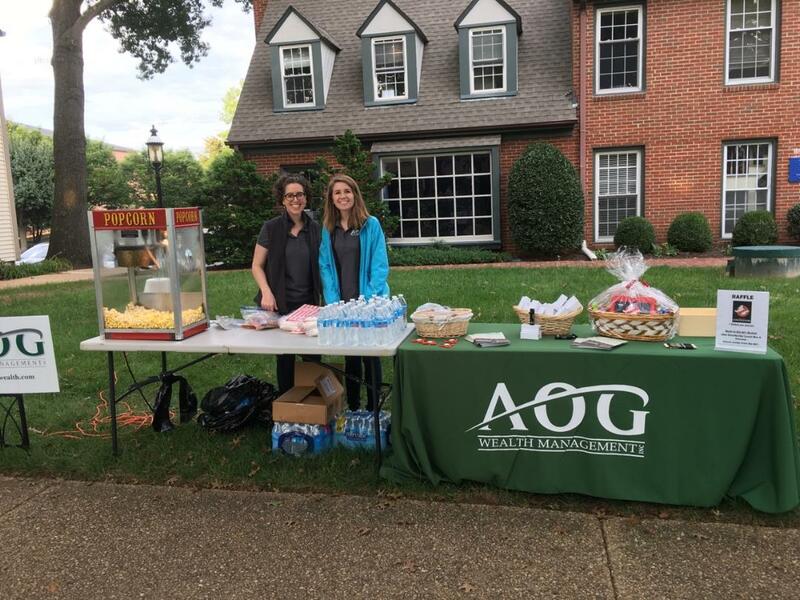 AOG in the Community: Movie on the Green 2018 - AOG Wealth Management, Inc.
On a crisp, fall evening AOG Wealth Management and Celebrate Great Falls enjoyed taking Great Falls back to the 1980’s with the showing of the original Ghostbuster’s film on the big screen. It was an enjoyable evening for whole audience, whether they were enjoying the Ghostbuster’s for the first time or the fiftieth. There was free popcorn and water for the audience, and AOG handed out their popular mini-flashlights to help see in the dark. To go along with Celebrate Great Falls 1980’s Movie on the Green Series theme, AOG raffled off a gift basket filled with 1980’s era candy and an authentic 1984 plastic Ghostbuster’s lunch box and thermos! It was fun to reminisce about our childhood lunch boxes with so many attendees.